Rejuvenation is the hypothetical reversal of the aging process. It provides new vigour and activates the person…. CM of Tamil nadu Ms Jayalalithaa is fond of the idea of rejuvenating elephants ~ especially the temple elephants. It is said that with this treatment, the overall physiological behaviour of the elephants improves. Further the blood supply improves, elephants get rid of physical ailments, its psychological behaviour and body condition improves with the treatment. This week, Tamil Nadu Chief Minister Jayalalithaa’s trip by road to the Mudumalai Tiger Reserve (MTR) garnered the glare in media. Reports state that Ms. Jayalalithaa offered delicacies such as jaggery, jackfruit, banana and sugarcane to an elephant calf, Cauvery, and two adult pachyderms, Mudumalai and Moorthy, at Theppakadu elephant camp. Cauvery, which was in a playful mood, took the Chief Minister by surprise by gently nudging her with its trunk. The passion of the CM for this scheme can be better understood that way back in 2003 also this camp was conducted for 45 days and more than 100 pachyderms benefitted in that. The scheme was launched for restoring the physical and mental health of the elephants held in captivity. It helped Forest department officials, veterinarians and elephant specialists study the animals in a natural environment. Away from all this, you sure would have read of the ‘story of the blind men and an elephant’ a famous fable in the Indian subcontinent and in other parts of the globe as well. The story is used to illustrate a range of truths and fallacies. At various times it has provided insight into the relativism, opaqueness or inexpressible nature of truth, the behaviour of experts in fields where there is a deficit or inaccessibility of information, the need for communication, and respect for different perspectives. In various versions of the tale, a group of blind men touch an elephant to learn what it is like. Each one feels a different part, but only one part, such as its legs, tail or the tusk. They then talk amongst themselves describing what they felt and disagree completely with what the view of others. The moral is ‘not to perceive things by what little is known’ !! Elephants are mammoth and majestic…. ~their eyes are captivating and delicate. Their eyes are small in relation to their body size and there is common perception that they have reduced ability in recognizing colours. Sadly, just like humans some elephants also become blind due to various reasons including improper treatment by its handlers. Sad would be plight of a visually impaired elephant as it would struggle to find its food and keep away from predators in a jungle. Back home in the city, TOI reports that a day after video clips of a two-year-old elephant, Cauvery, nudging chief minister J Jayalalithaa out of its way went viral on social networking sites, wildlife experts, including a veterinarian, confirmed that the female calf was totally blind ~ and it is stated that allowing anyone near an elephant with a visual impairment was a huge risk. Cauvery was among the 24 elephants paraded by forest department to welcome the CM at Theppakkad in Mudumalai Tiger reserve on Tuesday 30th July 2o13. Thrissur-based veterinarian Dr Giridas, who treated the calf about six months ago, said forest officials seemed ignorant about the behaviour of blind elephants. They had been warned against allowing the calf near visitors. “Though it was only two years old, allowing a blind calf to mingle freely with people is a big risk. Blind elephants identify people by smell and attack those unfamiliar to them,’’ he said. 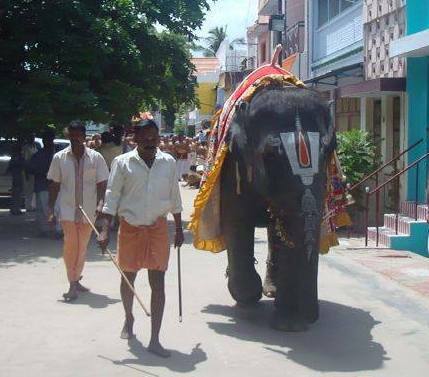 Giridas had also assisted Jayalalithaa when she donated an elephant to Guruvayur temple some years ago. When the state forest officials sought his service, he camped at Mudumalai since January to treat Cauvery. The video in circulation shows Jayalalithaa trying to feed Cauvery fruits. But the calf, disturbed by the noise and movement around it, appeared to push the CM, who seemed amused at first. Then the elephant gave her a harder shove and security personnel were seen rushing to prevent Jayalalithaa from falling. The elephant’s blindness was congenital and caused by vitamin A deficiency, said Giridas. “A blind elephant is distanced once the rest of the herd realises its disability,” he said. So Cauvery was brought to the camp. Earlier, while moving towards the reserve forest at Mudumalai, the chief minister’s convoy stopped near the Hindustan Photo Films manufacturing company where she received a petition from employees of this ailing public sector enterprising urging her to revive the company with her intervention. Hindustan Photo Films Manufacturing Company Limited (HPF) is an Indian-based public sector manufacturer of photographic films, cine films, X-Ray films, graphic arts films, photographic paper, and chemistry. Their photographic films are sold under the name "Indu", which means "silver" in Sanskrit (silver halides are used in film). The invent of digital cameras has rung a deathknell for photo films.